Cairns to Darwin removalists moving all your belongings that include precious furniture items, fragile crockery and cutlery, as well as sensitive electronic appliances. This can be difficult. With professional help however, it can be easy. You can pack, load and transport your belongings by hiring packers, movers and trucks from different providers separately, or leave the entire job to Australia’s premiere interstate removalists, Roadways Furniture Removals. We move Anything, Anytime, Anywhere! 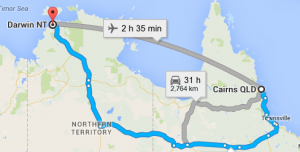 Cairns to Darwin removalists, just the best for the job! Roadways Furniture Removals uses the latest techniques, methods and equipment to handle your precious household/office items to ensure their safe relocation. For the best deals in customized removal packages, contact Roadways as your Cairns to Darwin removalists.